Inexplicata-The Journal of Hispanic Ufology: Mexico: UFOs or Drones Over Reynosa? REYNOSA, Tams. 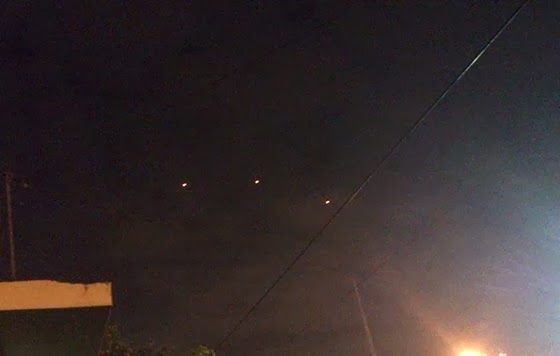 - For some months now, the skies over the city of Reynosa have been a source of polemics among citizens, as hundreds of witnesses claim having seen unusual red spheres traveling in threes in a triangular formation. These strange spheres appeared sporadically during the first months of 2013, but alarm over the lights was unleashed in the last three months of this year. Sightings have once again become more frequent in the first days of 2014. While some say that the UFO phenomenon is involved, others believe they could be U.S. surveillance drones flying over the center of this Tamaulipas city. Using social media, Reynosans have started sharing the images and video recordings they have managed to take of this unusual phenomenon, asking for answers on the nature of these unidentified flying object. Videos shared on YouTube and recorded by the residents of this border community show the three red spherical shapes, flying in a triangular formation, and becoming a source of bewilderment to those who saw them. The photos and recordings were taken on different dates and places by witnesses in Reynosa. However, they appear to match perfectly, since the luminous spheres have the same hue and do not make any noise. Monitoring drones or UAVs are vehicles that fly without any crew whatsoever and are remotely guided. They are frequently employed for military surveillance exercises and are able to maintain a controlled flight thanks to a reaction engine, which makes a high-decibel noise. - Target drones: They simulate airplanes or enemy attacks for defense systems. - Surveillance: These submit military information. - Combat: These are armed and ready for high-risk confrontations. - Logistical: Conveying items to a given area. - Commercial: Manufactured for entertainment purposes, such as movie-making. These vehicles are controlled from a distant base. However, others perform their missions autonomously, based on programmed systems that greatly aid their exploration missions. You can draw your own conclusions: are these intelligent airplanes, created by the U.S. government? Or could these lights that cause Reynosans such disquiet actually be UFOs?